Hugo Award-winning graphic novel artist Phil Foglio will illustrate the new Munchkin core set. Steam-powered robots and gears upon gears are coming to the back-stabbing, treasure-taking world of Munchkin. Steve Jackson Games announced August 13 that a steampunk edition of Munchkin will release in mid-2015. Munchkin Steampunk will be a standalone core set, playable independently of other Munchkin editions, and also compatible with all other Munchkin sets. So, your fearless adventurers can encounter clockwork monsters while wielding spy toys from Munchkin Impossible and struggling to stay sane thanks to Munchkin Cthulhu. "We really like clockwork spider automatons," says Munchkin Czar Andrew Hackard. "I mean, who doesn't? And they make killing monsters and taking their stuff even better!" 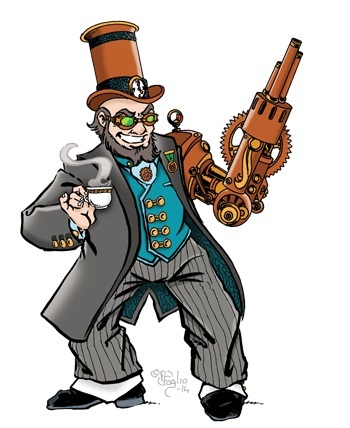 Munchkin Steampunk will be illustrated by artist Phil Foglio. Foglio is known for his work on the steampunk webcomic and graphic novels Girl Genius, co-created with Kaja Foglio. Girl Genius received the Hugo Award for best graphic story in 2009, 2010, and 2011. The Munchkin Steampunk set is designed by Steve Jackson. New Munchkin material is also arriving soon in comic book form. Steve Jackson Games announced in June that the card game will be getting a comic book adaptation from BOOM! Studios. Physical copies of the monthly comic will each include a Munchkin card. A date for the debut issue has not been announced.